VXAce Graphics Resource Creation Status: Unknown Contents Sprite Edits + Recolours > Graphics/Characters Window Skins > Graphics/System Tileset Recolours > Graphics/Tilesets Expanded Iconset > Graphics/System Backgrounds > Backgrounds Credits Check Sharing under -User Agreement- (TOU) Credits: -J. Edward > Sprites > Windowskins > Tilesets > Iconset > Backgrounds -Enterbrain > Sprites > Tilesets > Iconset > Backgrounds Special Thanks -Grandmadeb - Windowskin screenshots reminder. Notes: 1. You can import by using the Resource Manager, you can access it from either the toolbar in the editor or by pressing F10 while in the editor. 2. 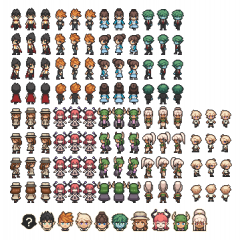 Sprites names go by personal preference. 3. Some of the windowskins use other window skins as a base. 4. Recolours go by personal preference. Total Attachments: 46 = 27 in Graphics/Characters -- 11 in Graphics/System -- 6 in Graphics/Tilesets -- 2 in Backgrounds Software Used: Paint XP, GIMP Graphics/Characters Graphics/System Graphics/Tilesets Backgrounds -User Agreement- (TOU) Usage 1. You can edit/recolour any content in any way you like. 3. You can use any content in any type of project. Sharing 1. You can redistribute any content wherever you please. 2. Credit me for any window skins you redistribute. 3. Credit me and Enterbrain for anything else you redistribute. Note: Linking to this thread is optional if you redistribute any content.